Commercial Pipe Repair, Lakeland, FL | A Step Above Plumbing Inc. Commercial Pipe Repair, Lakeland, FL | A Step Above Plumbing Inc.
You can rely on our quality workmanship when you call our team for commercial pipe repair in Lakeland. Having a pipe burst in the middle of a busy work day is never something you want to happen as a commercial business owner. 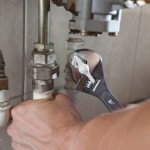 Having your plumbing systems in top condition is what allows you to serve your customers efficiently. In a similar way that you work to achieve customer satisfaction with your products and services, our team at A Step Above Plumbing Inc. is committed to high-quality customer service when you need commercial pipe repair in Lakeland, Florida. Our team is equipped to assist you with any-sized job, and we’ll work to ensure that your commercial business is up and running again as quickly as possible. Commercial pipe repair often begins with a diagnosis and getting down to the root cause of the problem. By completing a full assessment of your plumbing system, we can then take active steps to prevent additional damage and ensure that your commercial pipe repair provides a permanent solution. You can rely on our quality workmanship and our “do it right the first time” approach when you call our team, and we’ll always work with you to ensure that you are satisfied when your commercial pipe repair is complete. At A Step Above Plumbing Inc., we have been assisting both residential and commercial customers with their plumbing needs since 2003. No job is too big for us to handle, so when you need commercial pipe repair, we are your go-to team for the job. We’ll show up when you need us and work until the job at hand is completed and a solution has been applied. Contact us today if you would like more information about our commercial plumbing services.